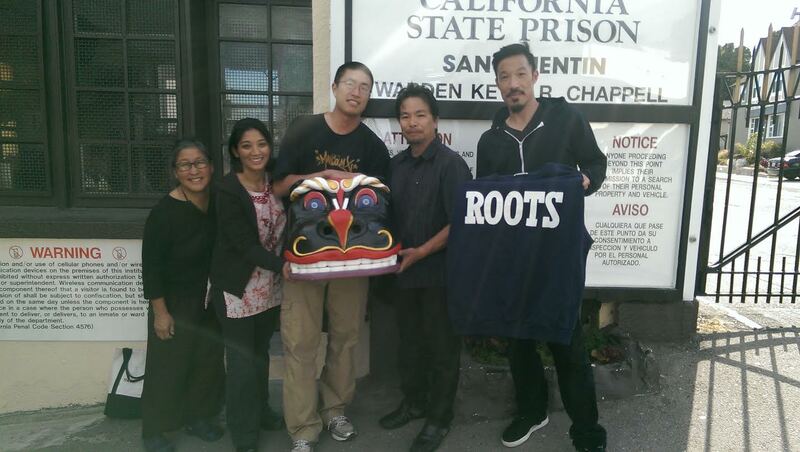 We are three months into our second year of the San Quentin ROOTS (Restoring Our Original True Selves) program, a class for incarcerated Asian and Pacific Islander (API) folks to learn about API history, culture, and healing practices. There are 35 people in the class, including 10 facilitators who graduated from the first ROOTS class we offered a year ago. The majority of our students are serving life sentences, and many were convicted when they were teenagers. One of our first classes was taught by Professor Roger Chung, who discussed the history of Southeast Asian refugees coming to the United States as a result of the Vietnam War and the CIA’s secret war in Southeast Asia. One of the students came up to Roger at the end of the class and said that if he had access to this type of education in high school, he never would have ended up incarcerated. Similarly, another student said that this was the first time in his life that he had heard his own family’s story so illuminatingly explained in the context of war and global migration, rather than just as a failure to adjust to their new home. In yet another class, Dr. Gurinder Wadhwa taught a class about the effects of chronic stress on the body. He had the students list the stressors they experienced on a daily basis, and the list filled the entire dry-erase board. About 10% of the list were stressors which are probably universal to the human experience (relationship drama, money problems, worries about family), but the other 90% of the list were things which most of us never think about on a daily basis: the sound of keys jangling, not being able to talk to or see one’s ailing parents, whether or not the water on the cellblock would be turned off, the possibility of being stabbed any day, and lastly, the general, ever-present absence of control over pretty much every aspect of one’s life. Every couple of months we break up the class format with a talking circle, an opportunity for the students to share their own wisdom and life experiences with each other. At the very first of these sharing circles one of the students spoke about a cherished childhood memory. When he was young he grew up in a refugee camp in Thailand. One day he had to get a tooth pulled, and when it was all over he was given a plastic horse as a reward for his bravery. He told about riding the horse down a steep hill at the refugee camp, flying past a crowd of children cheering him on. When the camp later burned down that horse was the first thing he rushed to save. One of the many inequities of our current criminal justice system is the way it reduces a complex human being to a sole identity: criminal. Everything that happened before the moment of the crime becomes irrelevant; the war, the genocide, the trauma, the relocation, the bullying, the violence, the triumphs, the kid riding his plastic horse down a hill…none of it matters after you break a law. In the ROOTS class we are trying to bring the forgotten histories and cherished memories back into the forefront of the picture to help us explain: how did we get here, how do we heal, and what is the way forward?